The Karisma Experience begins the moment you arrive at one of their hotels or resorts. From the first hello, you will encounter a commitment to personal service and comfort that is unprecedented in hospitality. Whether you choose to stay in one of their Gourmet Inclusive® properties, an à la carte hotel, an all-inclusive resort or a private villa, your experience will be one that you'll never forget. El Dorado Casitas Royale, by Karisma is a private enclave dedicated to providing an even higher level of luxury and personal attention. 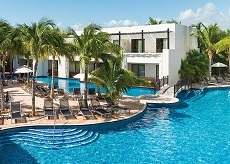 You're free to enjoy all of the dazzling amenities, restaurants and activities of neighboring El Dorado Royale and Generations Riviera Maya, but guests of Casitas Royale gain exclusive access to their own private pools and swim-up bars, a host of concierge services, aromatherapy and pillow menus and so much more. At Casitas Royale you'll enjoy a mile of pristine beachfront, 24-hour room service, beach and pool butlers and some of the best-trained chefs, bartenders and servers in the world. The experience at Azul Beach Resort Riviera Maya begins the moment you arrive, with a champagne toast check in for adults, Karisma's signature aromatherapy and pillow menu to choose from and Nickelodeon smoothies for kids. With only 148 deluxe rooms and suites, this beachfront oasis caters to families and couples who desire a refined yet more intimate experience. Everything is just a short stroll or stroller ride away, from the half-mile white-sand beach to the six restaurants, swim-up bars, Azulitos by Nickelodeon Kids Club and Vassa Spa. The Gourmet Inclusive® restaurants and bars at Azul Beach combine an extraordinary selection of mouthwatering à la carte menus and exotic drinks in a variety of settings. There are also Nickelodeon dining experiences, 24-hour room service and over 30 tequilas in the tequila lounge. Travel Channel named Maroma Beach one of the 10 best beaches in the world. El Dorado Maroma sits right in the heart of it. The beach will seduce you. 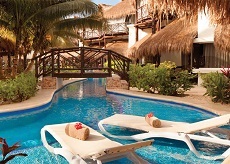 But it's the entire experience at El Dorado Maroma that will make you fall in love. The resort is intimately scaled, so you're never more than a short stroll from the beach, the pools, the spa, and a variety of bars and world-class restaurants, including a pop-up fish market every Thursday featuring seafood caught the very same day. 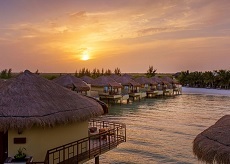 There are private, thatched-roof beach bungalows where you can enjoy a Sky Massage to the soothing ebb and flow of the ocean. And you'll find that our staff has an uncanny ability to accommodate your needs, often before you even realize you have them. You'll find world-class restaurants, renowned chefs, personal concierges and bars that pour from the top shelf. We harvest vegetables from our own 76,000 square-foot hydroponic greenhouse. We offer fitness classes, dance lessons and wine tastings. Twice a month, we host a culinary series featuring visiting chefs from around the world. Whether you're coming here to get married, escaping on your honeymoon or celebrating a beautiful life together, El Dorado Royale Resort provides the perfect backdrop for romance. 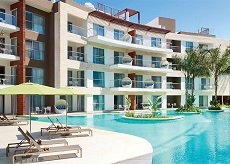 Whoever said youth is wasted on the young has never experienced Azul Fives Hotel, by Karisma. Because for tots, teens, couples, groups, honeymooners and even brides-to-be, this Gourmet Inclusive® playground will bring out the playful side in everyone. At the same time, Azul Fives' luxury accommodations and impeccable service will satisfy the most discriminating adult tastes. At The Fives Plaza, you'll discover trendy shops, live entertainment, four restaurants and two bars. Then make your way down to Azul Fives' white-sand beach, where swim-up bars, waterfront activities and gourmet à la carte eateries satiate even the heartiest appetite for food and fun.